Benjy Goodwin spots a linguistic pattern in the global political fallout – and challenges the UK to correct it, or face the consequences. Last week, pipe bombs were posted to the homes and workplaces of several prominent Democrats and liberal figures including Barack Obama, Hillary Clinton and George Soros. Though the devices were intercepted and casualties were avoided, a fierce debate has ensued in the States about the use of hateful language by politicians, and how dangerous it can be. “It is a troubling time,” remarked former Secretary of State Hillary Clinton after the bomb scares. “It is a time of deep divisions and we have to do everything we can to bring our country together. We also have to elect candidates who will try to do the same.” Her underlying message was clear: Trump and the Republican Party are encouraging this behaviour. A similar case was made by New York Mayor Bill de Blasio, who called on politicians to stop encouraging violence and hatred, which he claimed “is contributing to the choices people are making to turn to violence”. Trump, staying true to form, instead chose to blame the “mainstream media”. But Clinton and de Blasio are right – politicians do have the power to incite anger and violence in their supporters. The man who has recently been elected as Brazil’s next president, Jair Bolsonaro, has led an angry far-right, anti-LGBT+, and racist campaign. There have been numerous reports over the course of the campaign of attacks on minority groups carried out in his name. One man was murdered by a Bolsonaro supporter, after declaring he had just voted for the left-wing candidate, Fernando Haddad, and Bolsonaro himself was stabbed at a campaign rally a month before the election. Regardless, Bolsonaro could be considered a case of how politicians can stir up such hatred and violence – representing precisely the kind of dangerous politics that we ought to be avoiding at all costs. It is clear that the political conversation has soured in Brazil. In America, too, the consistent attacks on the media, and repeated encouragement of violence by the president, may have encouraged some of the recent attacks. Throughout Trump’s campaign, there was one refrain that always stuck with me: “Lock her up”. Used as a rallying cry to the Trump masses, it seemed to say so much about the Trump campaign. Firstly, the suggestion that Clinton was corrupt is classic anti-establishment rhetoric. More importantly, though, it is not actually the gift of a president to put people in prison. They appeared to be suggesting that they would storm to power and incarcerate Hillary Clinton, abusing the rule of law and the judicial system. It always seemed a pretty violent image, and implied that her real crime was simply disagreeing with Trump. Unfortunately, the UK is not immune to similar behaviour. Lord Sugar had said in the House of Lords that Boris Johnson and Michael Gove should be in prison for their £350m NHS pledge. I was taken aback. The suggestion was somewhat light-hearted, and was met with laughter in the Lords. However, it sets a dangerous precedent to start suggesting that politicians who mislead us or misuse a statistic should go to jail – not least because if they did, there would be none left, however appealing that may sound to some. However, we still have to ask ourselves why we aren’t having the same conversation here in the UK as they are in America. 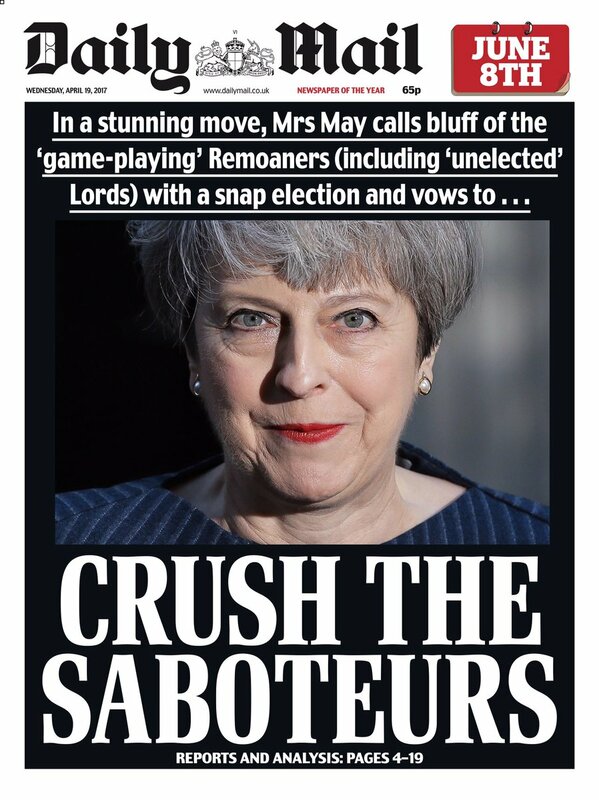 In recent years we’ve had repeated attacks on the judiciary, as well as attacks on rebel Tory MPs as “saboteurs”. As for the other side, some people noticed last week when an anonymous Conservative MP said that Theresa May should “bring her own noose” to a meeting of backbench Tories. The Prime Minister has a history of receiving violent threats, not least from George Osborne, who told staff at the Evening Standard that he would not rest until May was “chopped up in bags in my freezer”. Reading that in the wake of Jamal Khasoggi’s murder makes it all the more sinister. How did we get here? It certainly seems that the strange public schoolboy environment in parliament and choice actors in the media come together to encourage this sort of hateful, violent imagery. Indeed, Nick Robinson admitted on Friday that he did not bat an eyelid when reading the comments about Theresa May in the Sunday Times. For him, he suspected, it had become all too commonplace to stand out. Perhaps the House of Commons has always been this way. It hasn’t changed too much since the days of sword fights and duels, after all; but today, context is everything. Take this example: to raise money for Stand up to Cancer, Channel 4’s Twitter account offered rewards for donations. One of these rewards was to hurl abuse at Piers Morgan. One tweet read “Dear @PiersMorgan. Hope you’re having a wonderful morning. Why don’t you go and f–k yourself”. Morgan was in on his own abuse, and it was raising money for charity. But at a time when vitriolic online abuse is causing serious harm, and spiralling out of control, is it really responsible for a national broadcaster to be encouraging it? The same goes for our political discourse. If we believe that this sort of talk is having an actual effect on the actions of people in the States, we must be prepared to look inwards as well. Jo Cox MP was murdered in the street by a far-right extremist in the final weeks of the EU referendum campaign two years ago. This was during a campaign which many sought to portray as a battle between ordinary people standing up for Britain, and an establishment elite working on behalf of foreigners. In court, Jo Cox’s assassin gave his name as “Death to Traitors”. We live in a polarised, and, indeed, a “troubling” time. People are angry, and the more our politicians feed this anger with violent language, the more dangerous it becomes. If we can look at the US and Brazil with a critical eye, we can do the same to ourselves. There should be zero tolerance; our politicians and our tabloid media need to wake up to their duties and recognise the power they wield. They need to escape their bubble – or face bearing responsibility for the catastrophe they leave behind.